House price data this week from the Housing Department in the Ministry of Public Works (Fomento), and the monthly house price index from the valuations company Tinsa, show Spanish house prices still declining at a national level, though at a lower rate than before in the case of the Government’s data. The Tinsa Index for May, based on the company’s own valuations, showed house prices falling significantly more than the Government’s data suggests. Average national house prices were down 3.6 per cent over 12 months to the end of May, led by provincial capitals and large cities, down 4.9 per cent. House prices on the Mediterranean coast were down 2.3 per cent, and 2.1 per cent in the Balearics and Canaries. Year to date, house prices on the coast are up 1.4 per cent on the same period last year, but down 48.8 per cent since the peak, the biggest cumulative fall of all areas. The national average peak-to-present fall is 42.1 per cent, according to Tinsa. 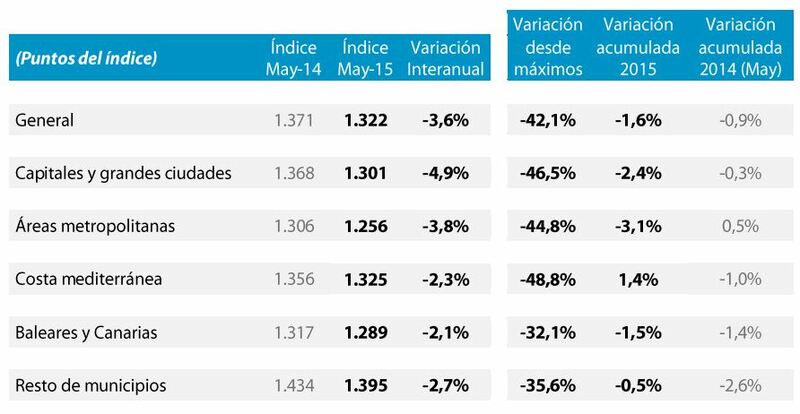 The average price for Spanish property fell a 0.11 per cent in Q1 this year to €1,458 per square metre. This is the smallest adjustment since the crisis began, according to figures published by the Spanish Ministry of Development based on 92,563 valuations. Compared to the previous quarter, house prices were down by 0.36 per cent. Since their peak in 2008 when they exceeded €2,100 per square metre, prices have come down by a cumulative 30.4 per cent. In real terms, after adjusting for inflation, the decrease is 36.3 per cent. 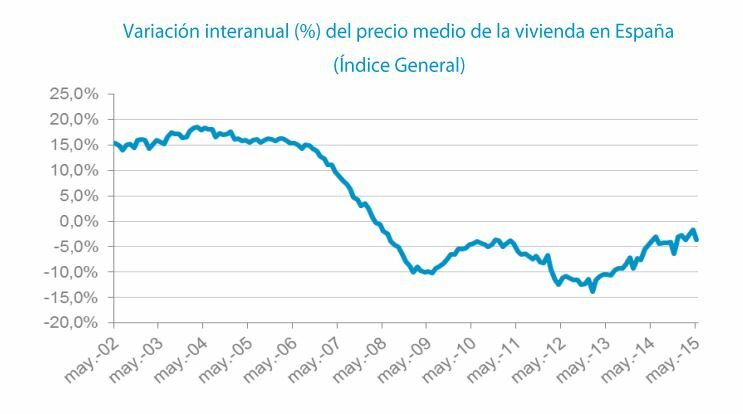 Spanish property prices started falling in the fourth quarter of 2008. Since then prices have fallen for 26 consecutive quarters, with the biggest fall at the end of 2012, when they declined by 10 per cent. In the regional terms, seven autonomous regions registered year-on-year increases: the Canaries (3.56 per cent), Aragon (1.9 per cent), Madrid (1.67 per cent), the Valencian Community (0.69 per cent), Extremadura (0.57 per cent), the Balearics (0.1 per cent) and Andalusia (0.05 per cent). The rest of Spain’s autonomous regions are still experiencing year-on-year decreases, particularly Asturias (6.53 per cent), Castilla-León (3.72 per cent), Navarra (3.15 per cent), Galicia (2.29 per cent), the Basque Country (1.47 per cent), Murcia and Ceuta and Melilla (1.35 per cent). Graphs like the one shown can be misleading and maybe they’re meant to be. In practical terms what does it mean? I like to think of the price of property in Spain since 2008 as a man jumping from a plane. He hurtles downwards for a time (until now?) and then pulls the ripcord. He still is going downwards ”ahough more slowly…” Eventually he will hit the bottom. The problem he then faces is how to go back up again….